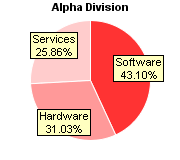 Multi-depth 3D pie and donut charts, in which each sector has a different 3D depth. 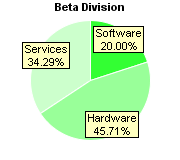 The pie chart has a gradient background, glass effect title bar and rounded corners. The donut chart uses semi-transparent colors and with metallic background effects. The sectors labels are created using ChartDirector Mark Up Language (CDML), so they can contain icons. This is just 3 simple pie charts. Even simple designs can look impressive when drawn with ChartDirector. 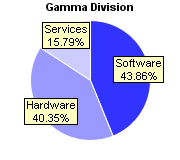 The sector labels are configured to overlap with the sectors to save space. A pie chart in which labels are positioned on the left and right sides and connected to the sectors with join lines. The label text boxes are configured with glass effect and rounded corners. Note that ChartDirector automatically shifts labels up and down to avoid overlapping.